A synthesis of the ecological information on 4037 species of birds found from Mexico south to Tierra del Fuego. This work summarizes details on 40 key ecological parameters for each bird species. Additional data and further analyses are provided for migratory species. Because bird communities are good indicators of habitat type and condition, and because extensive bird surveys can be done quickly, bird communities are critical to rapid evaluations of an ecosystem's biological value and integrity. 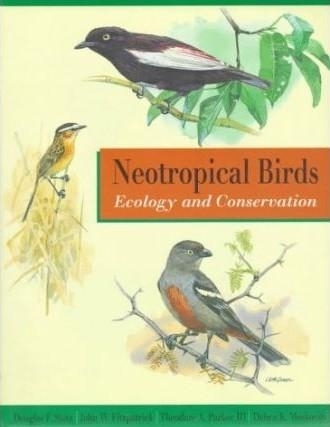 The authors analyze the bird species of major habitats from a conservation perspective, and develop specific guidelines to illustrate how governments, conservation organizations, and wildlife managers can use this ecological information to anchor conservation strategies on sound biological reality.